If you ever find me wearing anything other then jeans, it's most likely a dress, especially during the summer months. I had never been much of a skirt girl, until recently. The main reason that I shied away from skirts, is that I always had trouble finding the right tops to pair with them. I'd end up over analyzing if the top looked perfect with the skirt. Is it too bulky? The wrong color? Too short? That's until I realized that I was over thinking my outfits, and came to the conclusion that slightly imperfect, makes the best looks. Ever since, my skirt collection has been growing, and this twirl lace skirt from Chicwish is my newest obsession. I paired it with my blue Equipment blouse, for an ALMOST perfect match, and finished the look with my white pumps, and gold jewelry. I have to admit, I'm excited to try pattern mixing with this skirt, and can't wait to pair it with a stripe top, as seen here. Knowing my basic self though, I have a feeling this skirt will be on repeat this summer with a white tank and flat sandals. After all, sometimes the simplest way makes the best way. 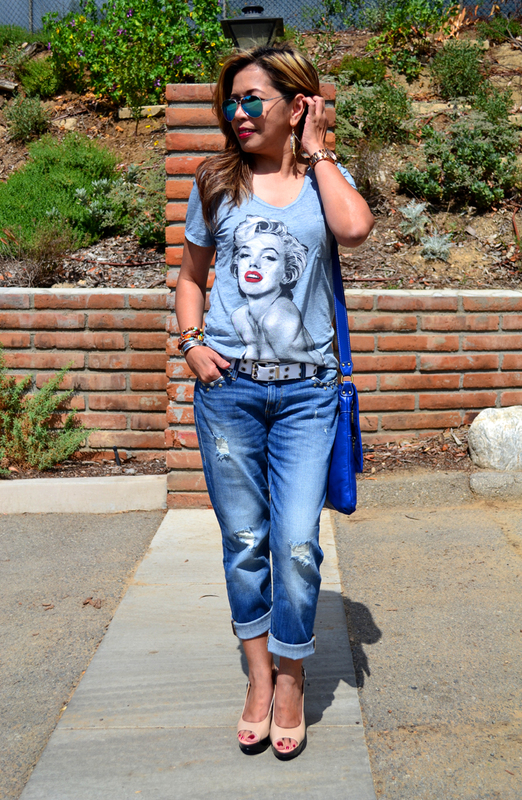 The feature blogger of the week is Rebecca from Red Tag Chic. I'm loving her boyfriend jeans! Make sure to stop by and say hello! That skirt is so pretty! Love the lace print and those fabulous heels! That skirt is GORGEOUS and you styled it perfectly. I love skirts, and will choose them over a pair of shorts in the summer any day. They are so much more comfortable to me. SO beautiful! I love that skirt! Hope you have a great weekend lady! This skirt and top looks so lovely on you. I've purchased one item from Chicwish and I was so happy with the quality and the efficiency of the my order, especially when I needed to exchange it for a different size. Enjoy your weekend. You found the perfect skirt! I love these colors together too. Such a fun skirt! I think the blouse is perfect with it! I just adore this skirt, Rachael. I am a big skirt girl...I buy them even when I don't have a single thing to go with them, not a shoe or a top, or anything. LOL! You did a beautiful job styling this skirt. You look fabulous! Have a great weekend! Ohhhh I want to recreate this look ASAP! Thanks for the inspiration. Gorgeous outfit!! I am the same way, I prefer dresses over skirts. But this skirt is definitely an exception! LOVE your skirt! So pretty for spring. Love this pretty blue patterned skater skirt! The clutch bag is adorable and eye-catching too! 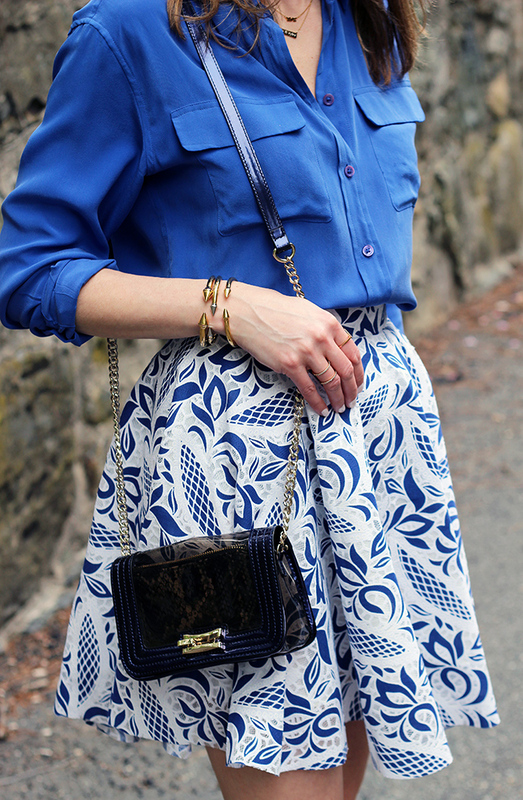 The print on your skirt is so beautiful! I love it paired with the blue and it will look equally nice with white or stripes. I'm also thinking a pale gray would look really good with it, too. Gorgeous! Love that skirt for spring, you look stunning!! What a fab skirt! It really is the focal point of this look - so perfect with the top and those gorgeous heels! 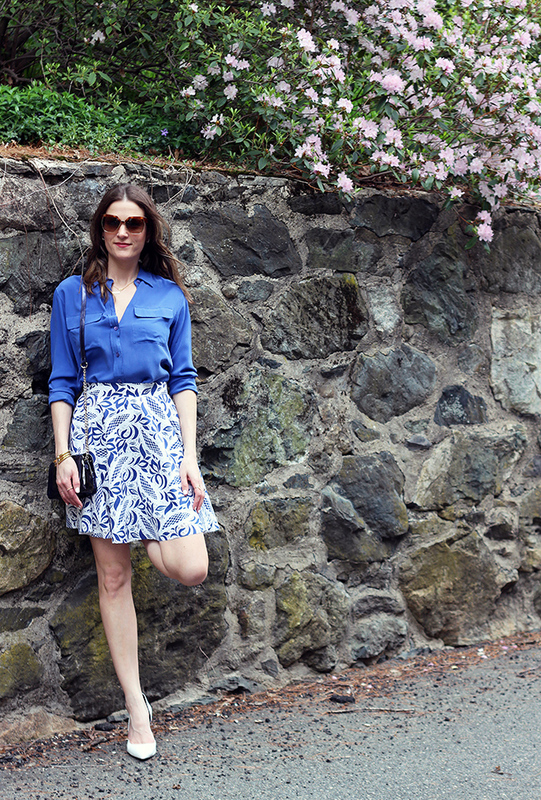 Such a pretty skirt, and blue looks amazing on you! One of my favorite looks you've ever worn! That skirt is to die for & styled it perfectly!